Have you ever wanted to access the internet, communicate with a friend in a different county, look up a call sign of someone currently on air, or even send a simple text message with just your Ham radio? All these functions are possible with the magical system of D-STAR. Which D-STAR Radio is Right for Me? 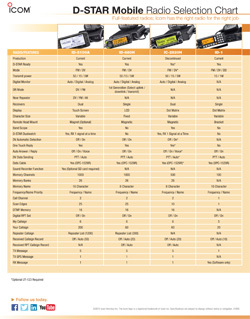 Now that you know what a D-STAR radio can do, we want to help you select the right D-STAR portable or mobile to fit your radio needs. 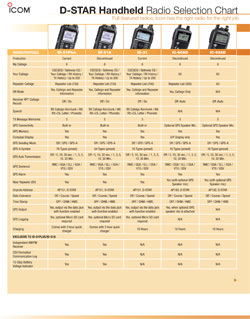 The following charts can help you compare the entire D-STAR product line based on features and specifications. What does "D-STAR" stand for? The D-STAR stands for Digital Smart Technologies for Amateur Radio. It is an open standard digital communication protocol established by JARL*. What can I do with the D-STAR radio? Communicate in 4.8kbps digital voice (DV) mode and 128kbps data* (DD) mode. When using DD mode with a PC and the D-STAR radio, high-speed data communication is possible. *DD mode is available with ID-1 only. Can I send data with a voice transmission? Yes, you can. In DV mode operation only, you can send up to 950bps of data, such as your call sign, short data message or GPS position with a voice transmission. Can I make a call with foreign countries? Yes, you can. The internet gateway sends your call to a remote D-STAR repeater over the internet. The D-STAR repeater call sign and IP address must be registered to the gateway server. Some restrictions may apply based on specific country regulations. Can I use the D-STAR repeater without connecting to the Internet? Yes, you can use a D-STAR repeaters a local repeater. You can also communicate with other D-STAR radios directly. Can I receive calls only intended for me? Yes, you can. The call sign squelch function opens the squelch only when your call sign is received. How do I set a repeater call sign when I make a call to a desired station using a D-STAR repeater? When you communicate with other D-STAR stations, using a D-STAR repeater, set the repeater’s call sign, the desired station call sign and your call sign in RPT1/RPT2. Making a call in the same time zone (without the internet gateway). Set the uplink repeater call sign in RPT1 and the downlink repeater call sign in PRT2. When making a CQ call, set "CQCQCQ" for the desired station call sign. Making a call in a different time zone (with the internet gateway). Set the uplink repeater call sign in RPT1 and the gateway call sign in RPT2. The gateway repeater has "G" setting for the 8th-digit. When making a CQ call, set "I" plus downlink repeater call sign at the desired station call sign.